One of my favorite places to bring my netbook and work when I’m tired of being the house-bound freelancer is my local independent bookstore, BookSmart. When my husband and I moved to our “new” town 5.5 years ago, knowing nobody, after six months of isolated work-from-home and no social life, I took a part-time job at Booksmart to stave off a desperate lonlieness. 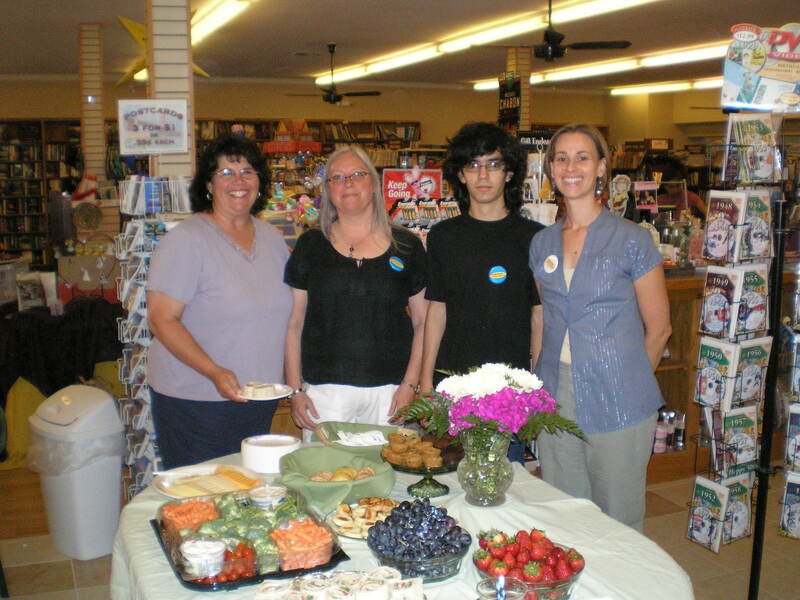 (In the photo, that’s me in the blue to the right, and one of the owners, Cinda, to the left in the black t-shirt and long hair). Not only did working there assuage the hollow feeling of being temporarily friendless, I quickly saw that BookSmart was a hub for the community—a resource for teachers, a respite for tired moms who could let their wild toddlers run rampant in the toys while they combed through the recommendations; a meeting place for retired ladies and singles to have coffee; a place for teens to hang out without causing chaos; and more, of course. It seemed so essential to the people who came on a regular basis, and myself. Am I just a special breed of bookstore lover, shaped by a childhood in which my single father took me weekly—sometimes several times a week—to one of three bookstores in our Marin county home? I can still vividly remember the mold-and-ink smell of the used bookstore, BookSmith, in San Anselmo, can still orient myself to the far left corner, up one brown-carpet covered step and to the right of the bathroom, where he stocked the hard-cover Nancy Drew mysteries I was allowed to purchase. Do I just have a special place in my heart for these shops? Then I think back on a big topic of conversation floating around in my liberal arts major back in college in the 90s, that of a “third place”—neither work nor home—where people can go, in fact NEED to go to fulfill other social and personal needs; “anchors” of community life that “facilitate and foster broader, more creative interaction…” as posited by Ray Oldenberg in his book The Great Good Place. Independent bookstores—notorious for being peopled with eccentric, down-to-earth folks and funky little cafes—are classic third places that fulfill a need, one that is enhanced by the presence of all that knowledge, stored between paper covers, hovering just in arm’s reach. As accepting as I am about the inevitability of digital publishing, of the slimming reality of print books, I have to admit that if the rise of digital publishing signals the end of my most favorite third place, it will be with great mourning.